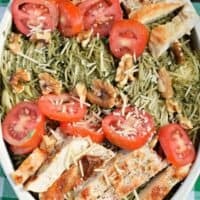 Whether you’re looking for an easy weeknight meal or a dish to share at a potluck, this Chicken Pesto Pasta is your delicious answer! Packed with flavor from the homemade walnut pesto, you’ll love how tasty this easy dish is to eat! I’m so torn this time of year. Do I want comfort food or do I want to keep using the grill? Either way, I need dinners that can be made fairly quickly, as our weeknights are hectic! 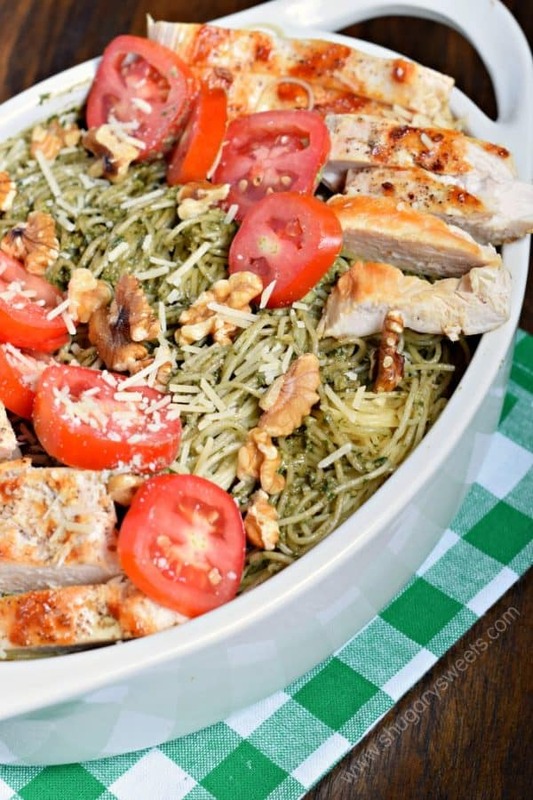 Today’s Chicken Pesto Pasta is super easy and versatile. It starts with a homemade pesto. Not just any pesto though, unlike this basic pesto recipe, today’s recipe uses WALNUTS. Oh my gosh, I always thought pesto had to be made with pine nuts. I was wrong. 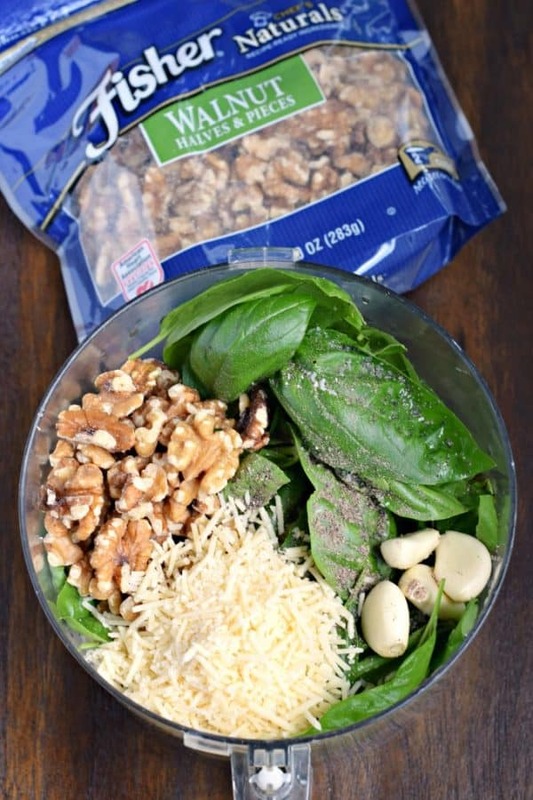 The walnuts add a delicious nutty flavor to the basil and garlic! In my ongoing partnership, I use FISHER NUTS brand walnuts, as they are preservative free. They also have the best flavor, in my opinion! Once you have your pesto made, you’ll add it to some cooked pasta. 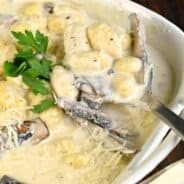 I use angel hair pasta for this recipe, as it doesn’t overwhelm the dish, however any noodle would work. Toss in some tomatoes, parmesan cheese and extra walnuts and you’ve got a delicious dish. Make it a meal by adding in grilled chicken! 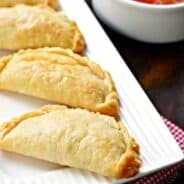 Not only is this a great dinner recipe, but it’s also a wonderful dish to bring to a potluck or BBQ. 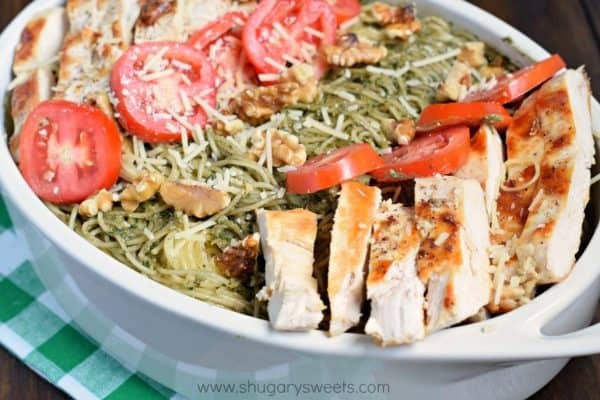 Whether you're looking for an easy weeknight meal or a dish to share at a potluck, this Chicken Pesto Pasta is your delicious answer! Packed with flavor from the homemade walnut pesto, you'll love how tasty this easy dish is to eat! In a food processor, combine basil, walnuts, garlic, salt and pepper. Process for several minutes until blended. Add in parmesan and olive oil and blend until desired consistency. Flatten chicken breasts to about 1/4-inch thick and grill for several minutes on each side, until fully cooked (or cook them in a skillet on the stove top). 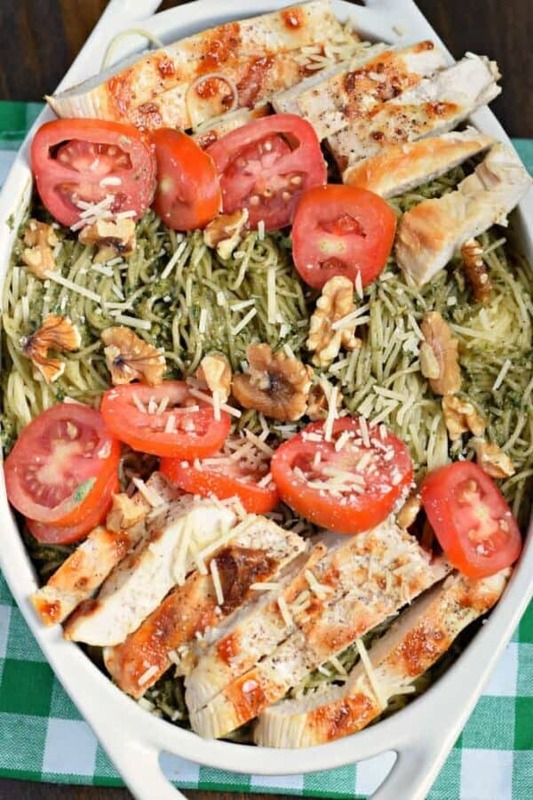 To serve, toss hot, cooked pasta with pesto, tomatoes, parmesan cheese, chopped walnuts and cooked chicken! ENJOY! 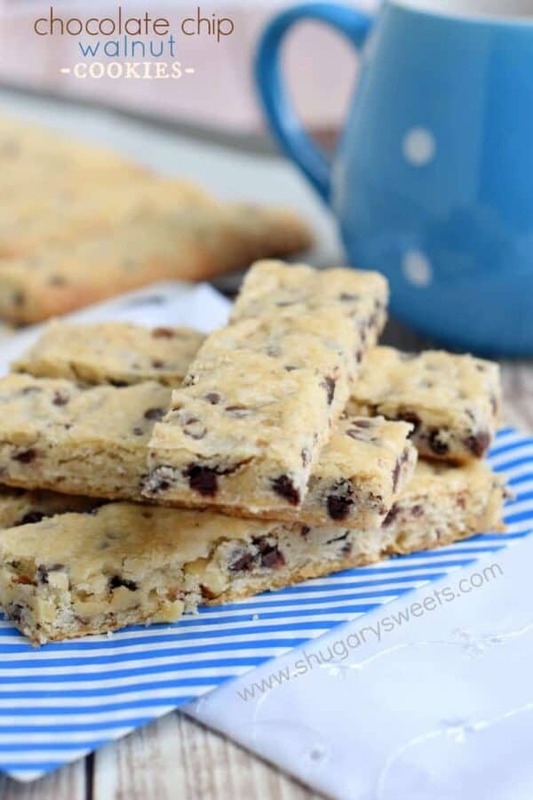 Chocolate Chip Walnut Cookies: delicious, melt in your mouth shortbread cookies! 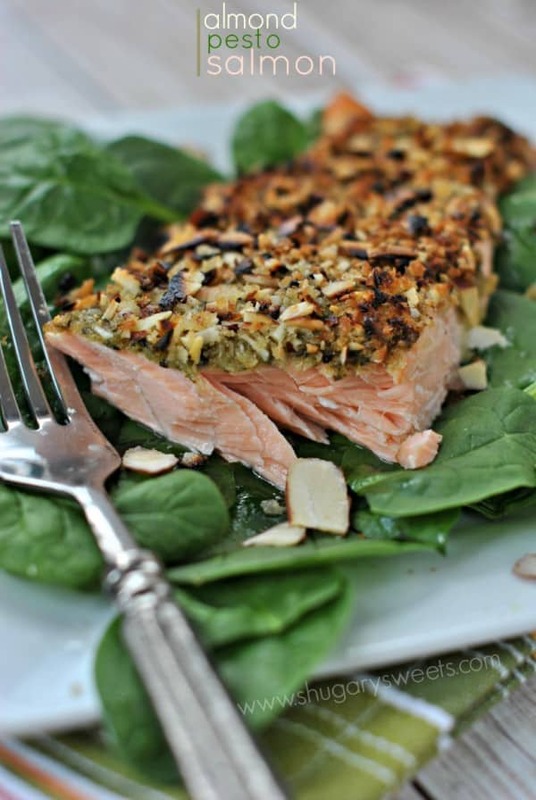 Almond Pesto Salmon: easy pesto on top of fresh salmon. DELICIOUS!! 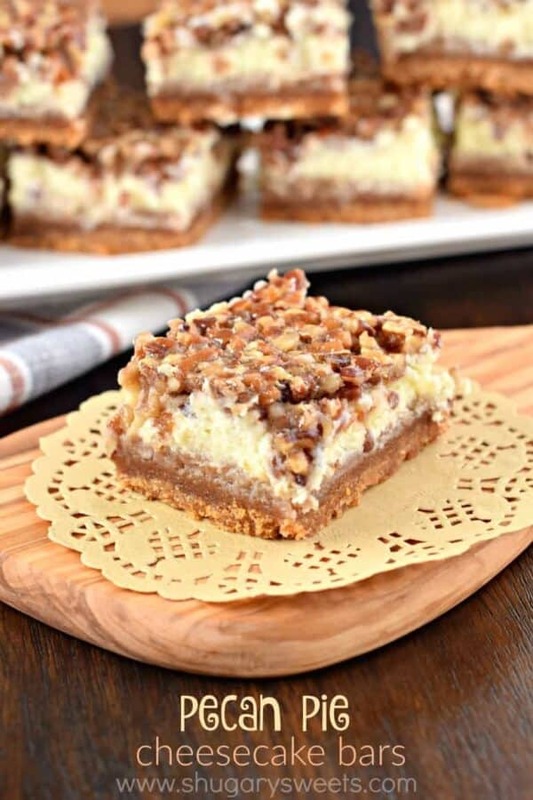 Pecan Pie Cheesecake Bars: one of the most popular recipes on the blog every fall, so tasty and perfect for holidays! I love Pesto! I can’t wait to try this, I especially love the nuts added! yum! What a great looking plate of pasta this is! 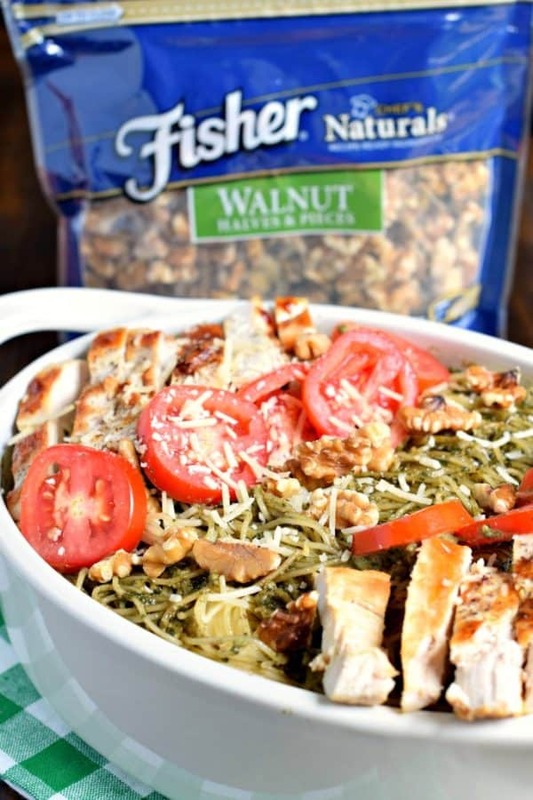 I love that you used walnuts for the pesto, I can’t wait to give it a try! Pesto pasta is a favorite around here! I need to try this soon! I am pretty sure that pesto should be my middle name, I love it SO much! I love Fisher nuts, and using walnuts is genius! I love making homemade pesto and using walnuts instead of pine nuts is such a great idea. 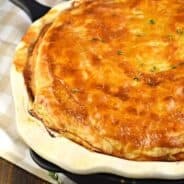 I will definitely add this to my weeknight rotation! Nothing better than homemade pesto!! can’t wait to try it with walnuts! This sounds unbelieveable! I love making pesto with different kind of nuts — it adds such a nice flavor. Toasted walnuts would be awesome! Perfect for us. we are a working couple and sometimes too much tired at end of the day. Thanks Aimee! !